Grey Wolf Lodge is a wonderful place where you and your family can get back to what matters. You'll never be bored at Grey Wolf Lodge! We have tons of fun stuff for every member of your family! Come relax on Pelican Lake! Only boat house on the lake. Slots available for nightly or weeklystays. Check out our authentic north woods getaways! Rent one of our fishing boats and catch a lunker with the family! See what fantastic opportunities are in our are! Northern Minnesota's Fishing Resort on Pelican Lake - Orr, Minnesota! Start your Minnesota family vacation in 2019 on Pelican Lake at Grey Wolf Lodge! Surround yourself with nature’s best – crappy, northern pike, bluegill, walleye fishing. See eagles, loons, osprey, pelicans, deer, beaver, otter and more! You won’t forget this MN getaway. This century old Minnesota family resort has seen generations of fisherpeople come to catch their limits, gather forfamily reunions & weddings and to renew on the shores of beautiful Pelican Lake in Orr, MN. Our Northern Minnesota resort on Pelican Lake is known for its fabulous Northern Minnesota fishing. Nestled on 45 pristine acres and covering 1,100 feet of sandy shoreline, our cozy cabins lie on the water’s edge, allowing each guest a fabulous view of beautiful Pelican Lake and its 55 islands. Wake up and witness a beautiful sunrise from your cabin deck and/or watch a family of baby ducklings feed outside your cabin windows. Witness the rare white pelicans, majestic eagles, soaring osprey, diving loons, bountiful deer, and other wildlife, as you enjoy your morning coffee and begin your day. Your Minnesota Family Vacation will be filled with wonderful memories of early morning fishing, and maybe an afternoon hike, bike, canoe, or kayak trip. Each day could be filled with fishing, swimming, beach volleyball, horseshoes or mini-golf. While the kids go fishing on one of our docks, you can relax, read, and sun yourself beside them. Fish Minnesota as the sun begins to set, or take a pontoon ride with family and friends, making this a vacation to remember. Evening campfires under the starlit sky are the perfect way to share stories and unwind after an exciting day. Maybe you will see the Northern Lights! Northern Minnesota fishing is a blast for every member of the family. 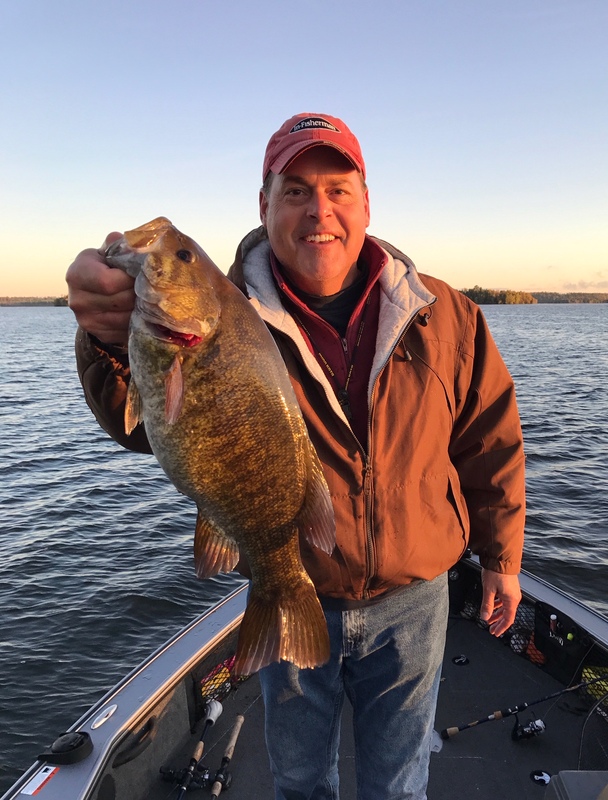 The Pelican Lake fishery is known far and wide for its abundance of pan fish (bluegills, crappies, and perch), northern pike, largemouth & smallmouth bass, and walleyes. From May through October, you can enjoy a Minnesota family vacation second to none. Fishing Minnesota must include fishing Pelican Lake in Orr, MN. We also rent our cabins to hunters in the fall. Bird watching is fun all year long. Berry picking begins in June and runs into July. Almost any night you can travel to the American Bear Vince Shute Sanctuary (7 miles to the west) and see bear cubs and families playing in their natural environment. Voyageur’s National Park, the Boundary Water’s Canoe Area (BWCA), and Canadian Border are within an hour’s drive of the resort. Make “Grey Wolf Lodge” your choice for your Minnesota family vacation, or your next Minnesota getaway. When nature calls, we listen. For those rainy days ALL cabins and the lodge have wireless internet, satellite TV. The Lodge has a pool table, foosball, board games, books and a small gift shop. The lodge is large enough for gatherings up to 50 people. We accept Visa, Mastercard and charge 2% processing fees for use of credit/debit cards. Personal checks and money orders are also accepted. We Are Pet Friendly! All dogs must stay on a leash, owners must clean up after them and shots MUST be up to date. $75.00/week. All specials are based upon availability & double occupancy. We want to pass on the savings to our customers!